Seven partners gathered in Santander for the project meeting. The project consortium discussed their findings related to social integration of refugees and migrants in urban gardens in Germany, Austria, Spain, Sweden and the United Kingdom. The partners developed materials for case studies (training and empowerment of refugees and migrants) during the meeting. 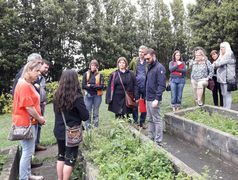 Our hosting partner Asociación Cantabria Acoge provided us also practical insight in local urban gardens. We visited the Urban Garden in Santander and had the privilege to meet the major of the city. Further highlights were a social dinner and a guided city tour. We are looking forward to meet each us again. In October we will come together in Vienna.